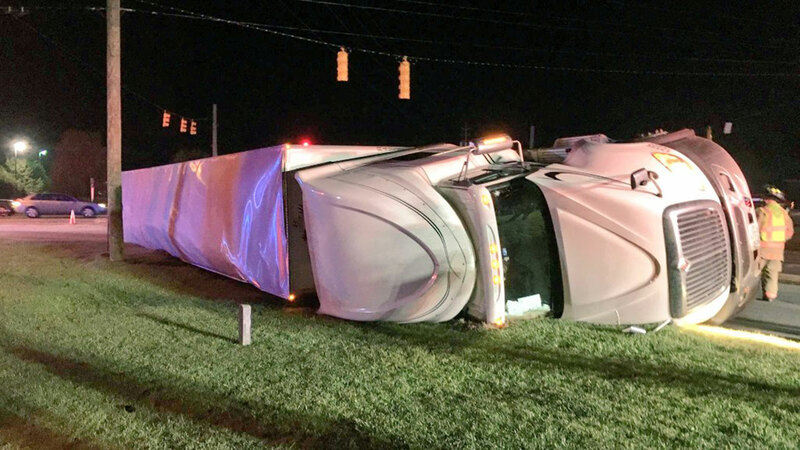 CLAYTON, North Carolina (WTVD) -- A tractor trailer full of vodka overturned near a busy US-70 intersection in Clayton Thursday morning. It happened around 6 a.m. along Shotwell Road at US-70. The truck flipped while making a right turn onto Shotwell coming from Fayetteville on US-70. The driver was reportedly OK after a passerby helped him get out of the vehicle, according to Clayton Police. It is unclear how much vodka was spilled. Authorities told ABC11 that uprighting the tractor trailer with 17 pallets of vodka - weighing 40,000 lbs - was easier said than done. Multiple tow trucks had to be called to the scene, taking longer than expected.